We are proud to present you the new Sylphyo and its new receiver device, the Link! 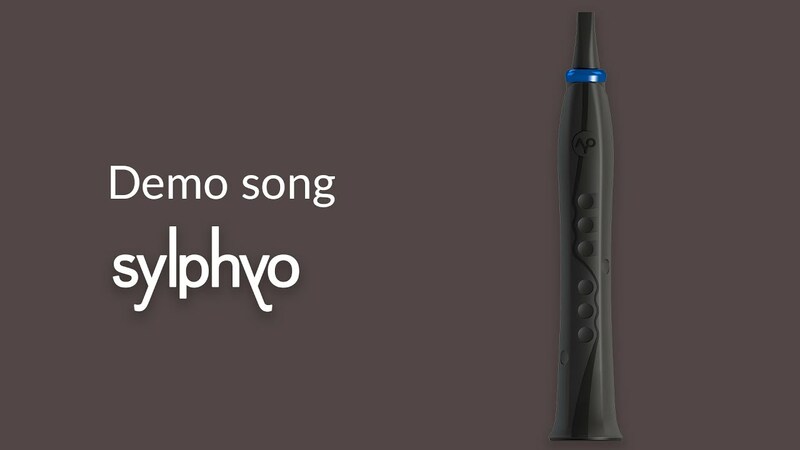 The Sylphyo is now a standalone wireless electronic wind instrument, with internal sounds specifically designed to harness all of its possibilities. This evolution makes it available to a wide audience, as you don't need to know how to use a computer anymore to use it. Just pull it out of your bag, turn it on, and strike up the band! The major new feature is the internal sound engine. You can now play the Sylphyo directly with headphones, or by connecting it to your hi-fi system or amp. The internal sounds are a bit different from those you can find in virtual instruments or classic synths, because they have been specifically designed to be played with the Sylphyo and to harness all of its possibilities (we'll see that you can also use them with other controllers). Each sound (or preset) is an entire sonic universe that you can explore and which you can use to invent novel tones using all the controls available on the Sylphyo. In the following video, Jonathan shows what some of them sound like in the context of an electronic music song. This is a quick preview of what can be done, and we'll soon add more demo videos for each sonic universe. The internal sounds react very well to breath control, like with a traditional wind instrument, and there is already much to learn about controlling their nuances (for instance, with different articulations: "ha", "ga", "la", "da", "ta"). But it doesn't stop there: by playing with the slider and the different inertial controls, you can completely transform the timbre of your sound. We're always amazed when we see what kind of sounds our testers can produce like after a bit of practice time. The Sylphyo remains accessible to beginners, but it is even more rewarding if you put in some work. Of course, having so much potential makes sound design a bit complex! We propose an initial bank of seven sonic universes. Dozens more are in the works and will be added as the months go by. In addition, we're working on progressively opening the sound engine to enable you to edit the current sounds and create new ones. As usual, you can count on us to turn the Sylphyo you have today into something twice better next year. A few more things… The Sylphyo now turns on in less than half a second. It also uses a new breath filtering technology derived from local research. And you can now plug it directly as a USB-MIDI controller, for those who like to travel even lighter. In addition to the sound engine, we also redesigned a new wireless system to make it even more reliable and to open it to future possibilities. And while we're at it, we also added wireless audio in the new receiver device. or even play the internal sounds using another controller or keyboard (MIDI or USB). As with the Sylphyo, expect updates and surprises in the upcoming months! As of today, every Sylphyo contains the internal sound engine. You can find the new Sylphyo at the usual resellers, but you can also buy it online in our new online store. The Sylphyo and its wireless Link are available as a bundle for 999€. If you don't need wireless, you can buy the Sylphyo only for 799€. The Link receiver device is also available separately for 299€, if you want to add wireless later, or if you'd like to use it as a synth and a USB-MIDI interface with other instruments. Our store also offers a new soft case tailor-made for the Sylphyo and the Link, additional mouthpieces, as well as a limited edition colored Sylphyo. Updates for all existing users! To current owners of the former Sylphyo model: we got you covered! Your Sylphyo was designed from the beginning to support these evolutions. You can upgrade your existing Sylphyo MIDI controller into a Sylphyo + Link combo at a discount rate by buying the sound upgrade at our store. And even if you don't want to upgrade, you can benefit from all the software updates concerning the Sylphyo, as usual. Just download version 1.3.0 of the internal software, which offers the new filtering method and enables you to use the Sylphyo directly as a USB-MIDI controller, without needing the receiver device. You can also just buy the Link and control it using the former receiver device, even though we highly recommend to perform the sound upgrade. We hope these news will contribute to ending your summer on a high note. We can't wait to get your feedback!